With a title like ‘The Power of Hope or: how community, love and compassion can change our world’ it is hard to believe that Kon Karapanagiotidis’s memoir could be a disappointment. Alas, disappointed is exactly how I felt as I moved through this quick read. This review is going to assume readers are aware of social activist, Kon Karapanagiotidis and skip forward to where I unpack why this book was under cooked. With no coherent thesis developed or argument put forward, it is hard to retain this disjointed book’s content. The insightful moments that should have anchored the narrative were instead sprinkled throughout. By sprinkled, I actually mean produced in a horrendous font that pulls quotes out across a full page before the line appears even in context. A terrible design decision that, if the book had a coherent narrative, would have been even more distracting. 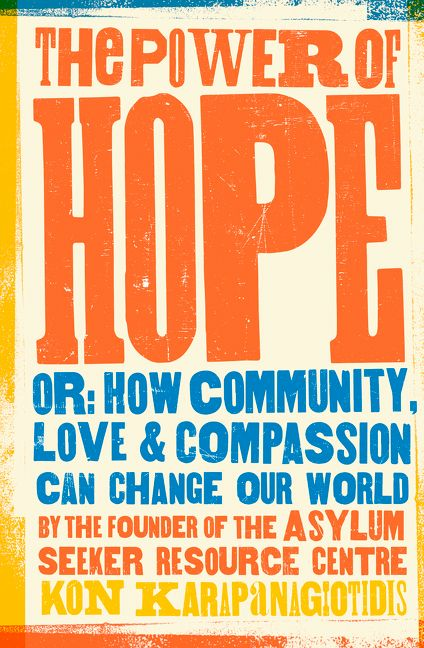 In the spirit of generosity that strengthens Australia’s (social) enterprise ecology, I expected to read about what worked and what didn’t whilst growing the Asylum Seeker Resource Centre (ASRC). I wanted to read about the ups and the downs, his approach to community building around a cause and what he had learned through the process. Unfortunately, these threads were abandoned just as quickly as he started to address them. Hold up – let’s acknowledge that the writing process is a vulnerable one and Kon truly does share some incredibly vulnerable moments. However, mastering the written word is a skill that takes time and it is clearly not his strength. Nor can we assume a productive relationship with his editor. Too often, I found myself wondering where is his editor; is it me or his writing style? Kon is apparently a compelling storyteller in person, yet spends fifteen chapters sledging Australia’s political system, ebbing and flowing around his childhood and other topics of interest. The somewhat tangential thoughts about gender equity and the need for men to lean in to their vulnerabilities all demonstrated a lack of coherent structure to his writing. Which isn’t to suggest this content isn’t valuable, rather it was poorly presented. Let’s not forget, even a compelling storyteller would have some sort of process before they stand on stage that would compliment writing a book. The hero of this book is a restless giant in chapter 16 (page 215 – skip to it). It is here that he opens up about why he is writing this book – the very real, life-threatening toll that his work has had on his personal health. ‘Why didn’t you start with this?’ I screamed internally in frustration on a very busy train. reflect on how this all started out in a classroom with your students and grew. There is still scope to weave in his strong sense of social justice, his Twitter personality, the influence Martin Luther King Junior’s words had on him at the impressionable age of fourteen and how Australian politics could change it’s position to be one that treats asylum seekers with compassion. I wanted dearly to love this book. I know too well the personal toll that entrepreneurial life can have on an individual’s well being and the strain on personal relationships. I shared this book with colleagues and friends hoping that they would tell me I had missed the point. Instead they shared my disappointment for what could have been an incredible read. – Alan’s review on Goodreads before we concurred in the office. If anything, Kon’s memoir teaches readers that believing we can change the world is powerful, but expect to wade through some relentless personal and business related struggles, and more to even get to the small wins. As for his intention stated in the blurb, to leave readers knowing ‘that we all matter, that there is a place for all of us’, well, it left this reader questioning whether the author actually believed it himself at the time of writing. If after reading this you somehow still feel compelled to read it yourself, save your money and consider borrowing my copy. ← Why I stopped working in the cultural and creative industries.